Here is another bag I need to have. 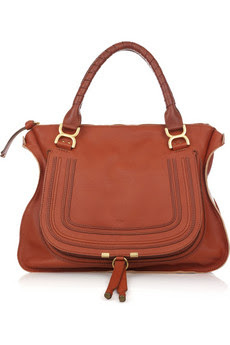 The Chloe Marci Tote. I have chosen to show you two different skins. 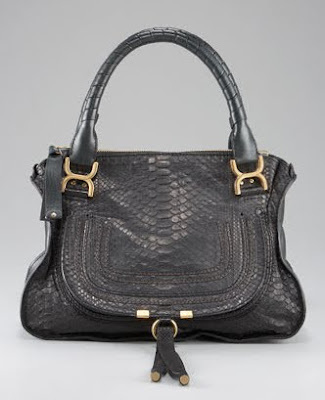 The black is python skin and the brown in leather. The python skin is definitely more luxurious than the leather. I however, love both. The leather is a great everyday option because it could be casual or dressier for work. I love the flap on the front of the bag. It creates a great visual appeal and makes this tote an exciting one. I love the top handles as well. They are the perfect length, and we all know I care a lot about that. The gold hardware pops on both colours but is not overwhelming. Also, it is big enough to carry all my day things, which makes this a winner. It's a really cool bag. Boho chic.